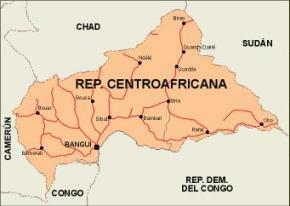 Central African Republic (CAR), is a landlocked country in Central Africa. 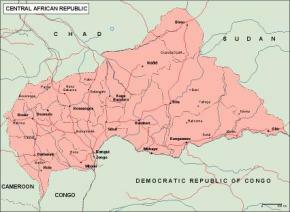 It borders Chad in the north, Sudan in the north east, South Sudan in the east, the Democratic Republic of the Congo and the Republic of the Congo in the south, and Cameroon in the west. Country covers a land area of 620,000 km2, and has an estimated population of 5 million. 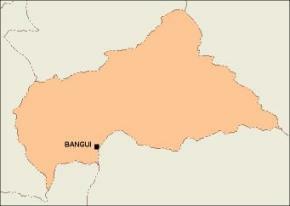 Bangui is the capital city. 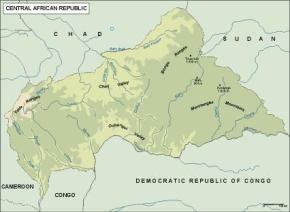 Most of the Central Africa Republic consists of Sudano-Guinean savannas but it also includes a Sahelo-Sudanian zone in the north and an equatorial forest zone in the south. 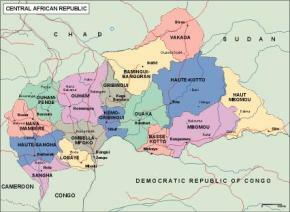 Two thirds of the country lies in the basins of the Ubangi River, which flows south into the Congo River, while the remaining third lies in the basin of the Chari River, which flows north into Lake Chad.